The Choir's latest concert was Faure's Requiem with other reflective pieces accompanied by the Fiocco orchestra. It was an huge success and sell out performance which was fitting as it was our musical director's Christopher Burton's, last concert with us. This was followed up by Carols at The Pots where there was standing room only and so another big success for the choir which concluded 2018 as these performances were preceded by Music through the Ages, which featured the hugely talented VoxSoc Choir from Winchester College and was performed to another packed church to great acclaim. Our concert in the autumn of 2017 was a different genre including light-hearted songs from the shows including The Lion King, Sister Act, Oklahoma! and The Sound of Music with the Cheriton Primary School Choir and accompanied by the piano, drums and bass guitar which created an excellent atmosphere. Our concert in November 2016 was Brahms' Requiem accompanied by the Fiocco orchestra and soloists Jake Phillips and Milly Forrest from the Royal College of Music and was extremely well received. 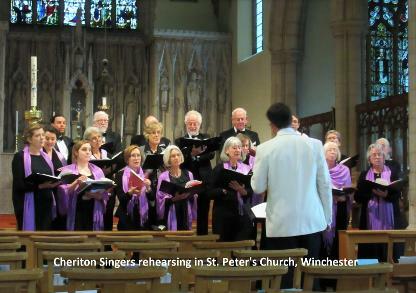 Our performances in April 2016 was a first for the Cheriton Singers as we sang in a special charity concert at St Peters' Church, Winchester with the Radcliffe Male Voice Choir singing a range of contemporary and traditional music rounding off the concert with the 2 choirs singing the Hallelujah Chorus. Other recent concert performances have included Handel's Messiah, Mozarts' Sparrow Mass, Faure's Requiem, Stainer's Crucifixion, Handel's Messiah (Part 1), Stanford's Te Deum, Britten's Choral Dances from Gloriana, Vaughan Williams' Five English Folk Songs, Kodaly's Missa Brevis - plus a large selection of lighter hearted arrangements including 'Songs from the Shows' with favourites from Phantom of the Opera, Oliver! & West Side Story. We have been pleased to sing for weddings at Cheriton, Odiham, Micheldever, Itchen Abbas, Beech (Alton) and St. Cross and Hyde in Winchester. Please do contact us if you would like us to sing on your special day. 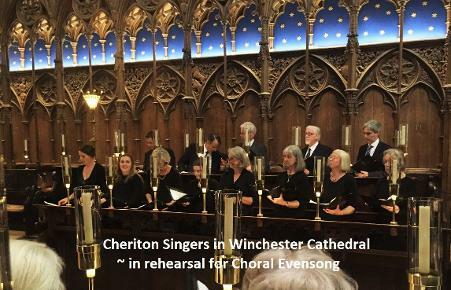 We have been fortunate to have been asked to sing at Winchester Cathedral Evensong on several occasions in 2017 & 2018 which has added another dimension to the choir and a great privilege for us all. The April 2016 concert was a special charity concert raising money for Southampton Hospital's Children's Ward & Canine Partners. In December 2014 we were invited to sing at Marwell Hotel, Fishers Pond for their Christmas functions on several occasions and once again performed at The Flower Pots Inn in Cheriton to help raise money for local charities and sung carols at an special fund-raising event in Kilmeston. Also in 2014 the choir sung in The Brooks Shopping Centre in Winchester to raise money for Help for Heroes charity. 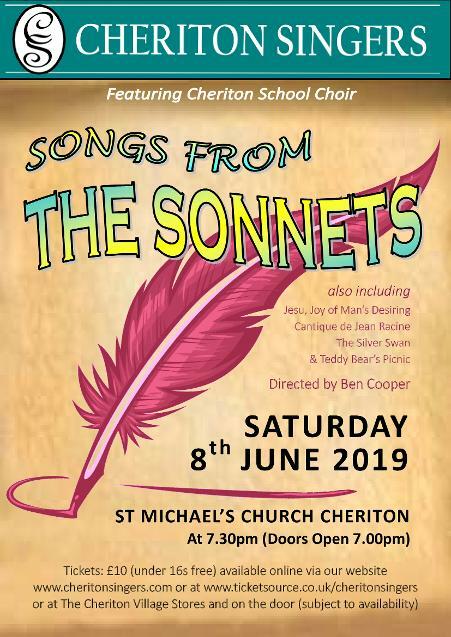 Cheriton Singers would like to express our sincere thanks to Gillian Gray-Knight and her team at Cheriton Village Stores for their continued assistance as our local box office and also to our many friends and helpers who ensure the smooth running of our concerts.